It’s time for one of our occasional round-ups of recent publications on silent film, though one or two have been around for a few months now, and not all are directly about silent films – but that’s what makes them interesting. 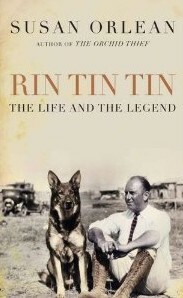 Rin Tin Tin – The Life and the Legacy, by Susan Orlean, has already made quite an impact in the USA, with its acute mixture of nostalgia and cultural history. It tells the story of Rin Tin Tin, the German shepherd dog rescued from the trenches of WWI by Lee Duncan, whose innovative training methods led the dog to Hollywood stardom in the 1920s. Rin Tin Tin’s star waned in the 1930s, but a succession of junior Rin Tin Tins either sired or inspired by the original kept the aura going into the age of television. Orlean makes some elementary blunders about silent film history, and Lee Duncan doesn’t make for much of a hero (unlike his dog) but it is readable, wry and occasionally wise. The Perfect Man: The Muscular Life and Times of Eugen Sandow, by David Waller, brings back to popular awareness one of the most remarkable, and certainly most famous, figures of the Late Victorian/Edwardian era, Eugen Sandow. Boddybuilder, strongman and adovcate of healthy living, he became the model of manly accomplishment for a generation. He also featured significantly in film history, being one of the very first subjects to go before the Edison Kinetoscope. He was also filmed by Biograph and even had a early film technology patent to his name. A terrific biography of someone whose life story illuminates the age in which he lived. Silent Films! 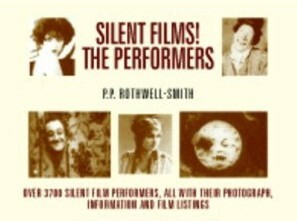 The Performers, by Paul Rothwell-Smith, is a self-published biographical guide to 3,700 performers from the silent era. This heroic undertaking was inspired by the author’s attendance at the British Silent Film Festival when it was held at the Broadway cinema in Nottingham. Rothwell-Smith is as interested in lesser-known names from the nether reaches of British film history as he is in those familiar to us all, and the book makes a bold statement of intent by having Clara Bow and Fred ‘Pimple’ Evans, knockabout British comedian of the 1910s, share equal billing on the front cover. I’ve not seen it, but the sheer scale of the endeavour commands respect. 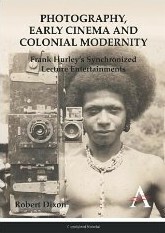 Photography, Early Cinema and Colonial Modernity: Frank Hurley’s Synchronized Lecture Entertainments, by Robert Dixon, adds significantly to our understanding of how motion pictures were presented that weren’t conventional cinema fare. As historians are increasingly uncovering, as as the Bioscope has tried to document, the multimedia show which brought together photography, films, music and live lecturer was widespread throughout the silent era, being used in particular for recouting true tales of adventure and exploration. Frank Hurley was cinematographer for the Antarctic explorer Douglas Mawson and Ernest Shackleton, and the book documents the ‘synchronised lectures entertainments’ (Hurley’s words) made out of these adventures, as well as the later Sir Ross Smith’s Flight and Hurley’s dramatised documentary of life in Papua New Guinea, Pearls and Savages. The book is aimed at the scholars, but there are lessons for all of us, because we still haven’t got our film history right – we keep focussing too much upon the films. 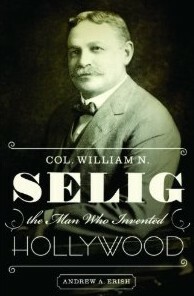 Col. William N. Selig, the Man Who Invented Hollywood, by Andrew A. Erish, published later this month, is a biography of a producer strangely neglected by film history. Selig was a magician and minstrel show operator, who encountered the Kinetoscope in 1896 and realised that motion pictures were for him. He was a notorious duper of other companies’ films in the early years, but moced to Hollywood, produced pioneering westerns and serials (The Adventures of Kathlyn in 1913) and specialised in animal pictures, with recourse to his own studio zoo. He was one of the most enterprising and colourful characters in early cinema, and this book’s bold and not wholly bogus subtitle ought to get people talking about him again.